The five-time winner inspired Real Madrid to a third successive Champions League crown last season and scored 44 goals in as many games across all competitions. 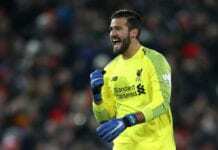 Joining him in the second batch of nominees are Real Madrid goalkeeper Thibaut Courtois, Manchester City midfielder Kevin de Bruyne, Liverpool forward Roberto Firmino and Atletico Madrid defender Diego Godin. France Football magazine are set to include 30 nominees for this year’s Ballon d’Or award, which will be announced throughout the day in alphabetical order. The Ballon d’Or is a prestigious individual award that was first presented to Sir Stanley Matthews in 1956 and has since been awarded to the best player of the year ever since. The Wales international is rumored to be moving out of Real Madrid in the summer, as the team doesn't seem to find a place for him. The Chelsea forward has been criticized a lot lately, but right now he is not paying attention to his detractors and is only working to get better.